Our Handlock deck list guide features the best Rise of Shadows deck list for Season 61 of Hearthstone (April 2019). Our Handlock guide also contains Mulligan advice, card combos and strategy tips. Handlock is a Hearthstone deck we’ve seen in many different forms over the years. Though it’s days in the top tier are long past us, there was a brief shot at resurgence using Genn Greymane from The Witchwood expansion. Now that card has been moved to the Hall of Fame, though, it’s time for a new approach to the archetype. Nevertheless, the goal remains much the same. Your purpose with this deck is to fatten up your hand - notably with your hero power - that will then allow you to field massive minions dramatically faster than you'd normally be able to. With all that power, the deck is coping well enough in Rise of Shadows meta. You can find the most competitive deck list seeing play in our Handlock guide. Further on we also have strategy and Mulligan advice, alongside a closer look at the key cards and combos in the deck. Here’s a deck list for Handlock that's enjoying a positive win-rate right now, although keep in mind that there'll be lots of adjustments over the coming weeks. If you’ve been a fan of Handlock from back in the day then much of what you’ll see here will be immediately familiar to you. The loss of Genn Greymane makes the list slightly different from Even Warlock, but this new version is played similarly in principle as you Life-Tap to fill your hand with cards, drop big minions on the board and then overwhelm your opponent with them. Rise of Shadows hasn’t added much at all to the deck in terms of new cards, so you should be able to pick it up and play as you did in the past fairly easily. You do get a new potential win condition with Arch-Villain Rafaam, but that’s not one to be relied on as much as the standard army of minions that are empowered by your large hand size. Early game: Life-Tap. Life-Tap. And Life-Tap. That’s most likely going to be your play during the early turns. You can always go for a Doomsayer if you feel your opponent is going to push hard on the board as that can stall their plans significantly. Otherwise, keep drawing cards and remove your enemy’s creatures where possible to keep the match even. Mid game: Always slam down a Mountain Giant or a Twilight Drake on turn four if you have one as they’ll be the most impactful plays at this stage of the game. It’s especially good if you can pair either of those big drops with a Sunfury Protector to give you some excellent early game protection or a Faceless Manipulator to add to the pressure. Rotten Applebaum and Proud Defender are also solid drops at this stage of the game. Elsewhere, Hellfire is your big AOE play if you need to shut the opponent down from expanding on the board. If you’ve taken a bit of a beating in the early game you can look to heal up with Lesser Amethyst Spellstone and Shroom Brewer. The former is best played when upgraded at least once, so hold off unless there’s a minion you desperately need to remove. Late game: Continue planting big minions on the board and taunting them up where possible to overload your opponent with giant threats. Omega Agent is good value on Turn 10 to build up a board if your opponent has kept it under control, while Arch-Villain Rafaam can be a risky but hugely rewarding play if you get some strong legendary creatures from it. Eventually, your opponent should run out of ways to remove all these ginormous cards efficiently and you can start sending all that damage directly to their life total. 1. Control the early game with your cheap removal cards such as Mortal Coil, Doomsayer and Shadow Bolt. 2. If you’re not holding any removal try to save your Sunfury Protector to set up the strongest wall of taunt minions you can. 3. Using Life-Tap frequently in the early game may seem dangerous against aggro but you have taunts and healing to keep you safe going into the mid-to-late game. 4. As soon as your opponent extends too far on the board you can go for a Hellfire to - hopefully - wipe out all of their minions. 5. As soon as you’ve dropped you giant minions on the board you can start ignoring their weak little minions and go straight for their life total. 1. You have even more freedom to Life-Tap in the early game against control as they’ll have a slow start too. 2. If they're a weapon-wielding hero, try to hold onto your Acidic Swamp Ooze until such time as it can crush their blade. 3. You can use Spellbreaker to quash cards with powerful effects and continue the onslaught of giants. 4. Be prepared to lose your first couple of big minions to their removal effects, but make sure you have another larger play to follow up with on later turns. 5. You can turn the tables in a unique way by using Faceless Manipulator to copy one of their more powerful creatures should you find a good opportunity to do so. 1. Mountain Giant: As you’ll be spending many of your early turns using Life-Tap you should be able to get a Mountain Giant out very early. 2. Doomsayer: As a way to slow down aggressive decks early this is perfect as it’ll force them to do nothing for a turn or adjust their game plan dramatically. 3. Twilight Drake: You’ll want to hold this for the same reason you’ll grab Mountain Giant – with such a full hand you’ll be able to give the dragon a big health boost. 4. Mortal Coil: Use this to finish off your opponent’s early weaker drops while also ensuring that your hand remains full. Keep all of these potential card combos in mind when playing Handlock. - Mortal Coil will draw you a card if the damage is used to kill a minion, which is a huge bonus as it maintains your hand size to get the full use out of Mountain Giant and Twilight Drake still. - If you're opponent is holding a weapon at the time the card is played, Acidic Swamp Ooze will smash it to little pieces! 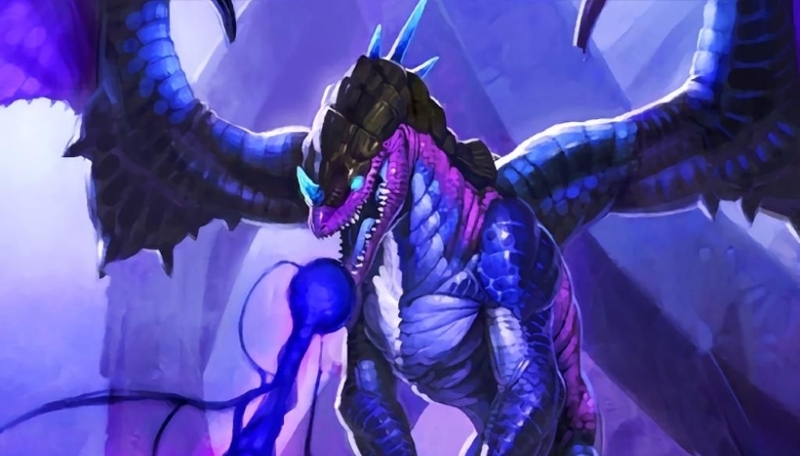 - Twilight Drake gains an extra point of Health for each card you have in your hand when you play the Dragon onto the board. - Mountain Giant costs one Mana less for each other card you have in your hand. - Always keep in mind that Hellfire will damage both heroes and all minions on the board. Make sure you get the most work you can from your minions if they're likely to die in the fire anyway! - When playing Faceless Manipulator always aim to target your biggest cards such as Mountain Giant and Twilight Drake. One of these is hard enough to deal with for your opponent – let alone two at once! - Try to wait until you have 10 Mana before playing Omega Agent. A single five Mana 4/5 is not particularly great value, but to get two copies for that price is great value indeed. - It’s best to save Arch-Villain Rafaan until you think you’re running low on big minions to play as this legendary replaces ALL other cards in your deck. The replacements can be very strong but be sure you don’t lose something from your actual deck list that you’d like to use first! - Lord Godfrey is like having a super-powered Defile that also gives you some board presence after the effect. Ensure you double check your maths to see how many times the two damage effect will repeat as it’ll trigger again on each minion kill. A handful of key cards make up the Even Warlock deck list and there isn’t much room for alternatives. This is still a relatively cheap list to craft though. Sunfury Protector: The only way in this new list to give the deck’s big minions taunt. You’ll want to try to save it so it hits two minions, ideally the big targets such as Mountain Giant or Twilight Drake. Doomsayer: A perfect way to stall your opponent in the early stages of the game so they don’t stretch too far into the lead as you work towards your bigger drops. Earthen Ring Farseer: With all the Life-Tap uses you can quickly work through your Health so this bit of extra healing is nice to have to top you back up. Twilight Drake: With all the cards you’ll be holding in your hand this can get a substantial buff to its Health that many opponents might struggle to deal with efficiently. Faceless Manipulator: Using this to create a copy of one of your big minions, sometimes the turn after you’ve played them, can put you into a strong lead in the game. Omega Agent: Gives you a way to re-establish a board presence should you reach the late game finding your opponent has answers to everything. Zilliax: Can help you catch up on the board if you’ve fallen behind thanks to the Rush keyword while also providing some very useful healing. Arch-Villain Rafaam: Whether this card stays in the list for long remains to be seen but for now it offers a fun if risky late game option to fill your deck and hand with legendary minions. Lord Godfrey: Has some ludicrous board clear potential so is a great card to have in case you fall very far behind. Twisting Nether: This spell is another option to look to if you’re being overwhelmed by your opponent as it’s essentially a big reset button for the board. Mountain Giant: Synergises so well with your hero power that it’s mandatory to run two. As soon as you give them taunt they become significant obstacles for your opponent. Morning, looks like Handlock is back minus Genn. I've dropped a temporary deck list in here if you want to play the new version of it, and we'll be converting the guide completely once we have a more refined version. Some of the comments in this thread might refer to Even Warlock / Genn, so thought it was worth making a note about the changes directly here! why does no one ever post comments? Sorry about that I can't think why it had stopped showing up. I've added it again and will keep an eye on the post too. Have fun! Mmm... you forgot to post the deck itself! You've mention Siphon Soul in your guide, but Trump's deck doesn't run it.